Catolonia is known for its denseness of difficult routes. And one area stands out extremely: The ‘Cova Grande’ cave at Santa Linya, in the cool months ‘the important meeting place’ of the international climbing scene and the ideal trainings area. Countless lines promise great challenges at the highest level. Next to the Neanderthal project, which up until now is not yet ready, there is one line from the main area of the cave which can climbed completely: La Novena Enmienda, checked out first by Dani Andrada in 1995, then rated at 9a+/b – is validated at the world’s most difficult route. The 55m long and also overhanging line combines La Novena Puerta and La Traversia de la Enmienda, both rated at 8c+. 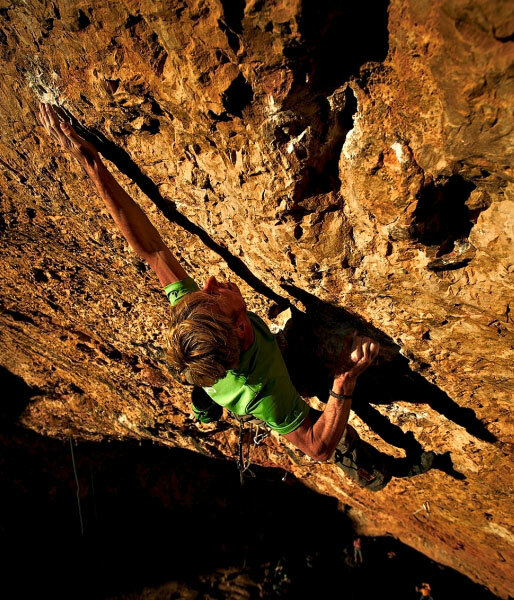 For Andreas Bindhammer, who in his home area the Allgaeu, had only been dealing in summer with the short, maximum strength routes and boulders (Frontman Deluxe 8c+/9a), found it a real challenge. The first days were really tough, with three times rest to the first chain – nothing else worked. After a few days he managed to climb the La Novena Puerta, but in the second part of the route his reserves failed for the difficult boulder crossing. My level of maximum strength diminished thereby visibly and I was often less able to climb the first part of the route. A change of training was inevitable. 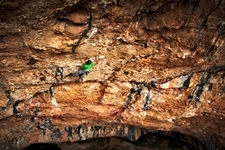 The new approach meant to start some attempts in the route on the first day, followed by solely bouldering on the second day in order to keep the level of maxim strength on constant height. The new approach came out even. Within a short period I was able to climb the first part of the route without a warm up and could concentrate completely on the upper part. However, more than three attempts a day were not possible. Heavy wind and low humidity conditions, which Andreas has hardly came across with this year, will help to finally start the advanced ones off in the route in November. 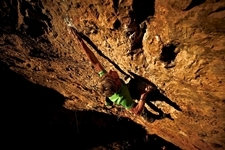 The hardest move in the upper part of the route- a brute braking pull in a one finger pocket – is now regularly doable by attempts from the bottom. The new Crux is now the undercut crossing in a hidden slit, only two pulls thereafter. Cold conditions in the evening and a bit more reserves in the crux ensured Andreas on the same day the wished success: the slit is in the hand. In the following undercut passage which is easier he tries to recuperate himself. Also the next passage with enormous far moves succeeds. Only about another 10m are missing until the top chain. Just have to go through this next undercut, and then better holds will occur. The cheering from below becomes silent when Andreas lets off and hangs further below headlong from the rope. The route is not yet terminated, but his strength on the contrary is put to an end. After this attempt I realized that it would succeed, when anything didn‘t go wrong. I also tried to recuperate myself as much as possible in order to go ahead with a new attempt. It is windy and cold that day. – So cold that Andreas, with his blurred face, by each reasonable hold, presses with his free hand on his body in order to warm it up. Shortly before the middle of the route it seems as if he had lost the feeling in his fingers and he couldn‘t go on anymore. With a temperature of 10 °C and a strong wind which withdrew his energy bit by bit, his muscles contracted and went stiff, the movements seem cramped and blocked. Equipped with a long-sleeved shirt Andreas starts a new attempt a bit later. At the third bolt he is already finished, his body cooled down too much after the break. It doesn’t matter, he doesn’t give up.- The same again. This time he can manage to keep his fingers warm. Andreas struggles upwards bit by bit. The key passage in the upper part seems to go more relaxed because of cold conditions, more than usual, the move to the slit succeeds slightly, but it succeeds. Everybody cheers. It’s Sunday and despite the temperatures the cave is full of climbers. Will he go down again head first? Up until now everything seems controlled and flowing. In a moment the undercut will come, so far the highest point on the best of his attempts. The body topples back, but this time the hand is on the hold. It goes further. On the two best holds in the upper part of the route, Andreas now tries to bring his finger tips for the last meters back to operating temperature. The following narrow and clearly athletic section requires full concentration once again. It takes about 5 minutes before Andreas gets started. Everything looks good. He appears over the edge. A little bit later everybody cheers again, this time together with a barely audible relieved cry from above. The same cheers outside the cave were followed by a chorus of horns by those climbers who fled the cold by sitting in the car, symbolizing that he had made it. The Marathon through the roof of the cave has found an end.